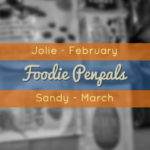 This was my fourth month participating in Foodie Penpals. 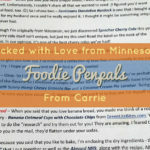 For this month & November, I’ve been “splitting” Foodie Penpals with my sister, Ariel. We build the boxes together and share the boxes we receive. 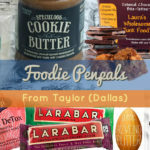 We totally forgot to document November, so this is only our 3rd FPP post. 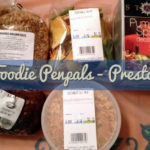 Since our box arrived at my sister’s house, I had her type up this Guest Post and snap some the pictures. What was inside: a great variety of tea (chai, raspberry, mint, etc. 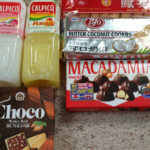 ), a white chocolate macadamia Luna bar, ginger chews, spearmint gum, a See’s chocolate lollipop, and tea bags to place your own loose leaf tea in it! Everything came in a festive red snowflake tin – which was perfect to store my tea in. I’ve just been sticking my teas into the kitchen drawers – now I can have them all in one place! I really enjoyed Esther’s package since I feel like she knew me. I unfortunately gave her really vague guidelines, saying I love tea, Luna bars, chocolate, and on-the-go things. She nailed me! I love ginger chews! I actually get nauseous sometimes and those are really handy to have in your purse. I really can’t wait to try the different teas you got me and the little tins are so cute – they have cherry blossoms and geishas on them. She told me that she got them in Pearl River Market in NYC. I love going to NYC and I have been there before, so I will pick them up again! 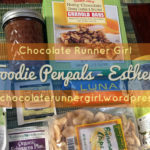 Thanks for my perfect package, Esther!